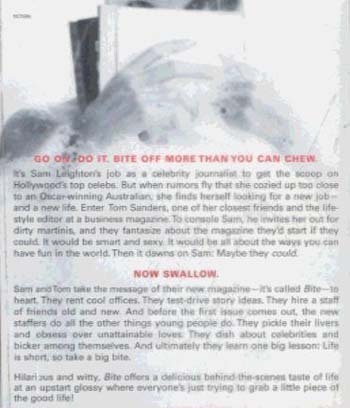 Sam and Tom should love their jobs: she's a Hollywood journalist, he's a lifestyle editor at a business magazine. But when they're give the opportunity to start their own magazine, they jump at the chance. It's called Bite, and it's for anyone who wants to have a little more fun. That includes Liza, the socialite art director who may or may not have had it up to here with her banker husband; Veronica, the downtown photo editor who also may have had it up to here with Liza's husband; Andrew, the uptight numbers guy, who also happens to be Tom's best friend and Trevor, Tom's fox of a brother. No one said starting a magazine would be easy, but no one said it would be hard in exactly these ways. Which character almost screws it all up when offered a shot at a dream job? Who must choose between the man she loves and the man she loves sleeping with? Who keeps messing around with the interns? 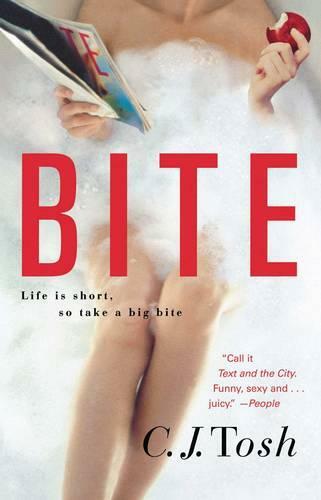 BITE is better than a juicy gossip column. When this motley group discovers what it's actually like to spend a day doing something they believe in, the result is both hilarious and heart-warming.